Do you have cords, wires, and adapters just sitting in a cupboard or drawer, with no purpose other than taking up space? Of course you do. The average person will replace old or broken devices, and find the new devices aren’t compatible with the old cables, leaving them stuffed in a junk drawer or in a random box that they’ve kept “just in case.” Every home or business has the same scenario going on: lots of wires and cables left over from all the e-waste they have discarded over the years. If you want to get rid of your unwanted cables, here are a couple of tips on how to do so properly. The first thing you’ll want to do is take inventory of all of the cables, wires, and adapters you have to ensure that you aren’t going to toss something that will have value to you. The notion you had when you didn’t throw them out earlier could be the right one. For chargers and other adapters, you may want to keep some around that still have use. Smartphone chargers with USB Type-A and Type-C cords can be of use if you have guests since most smartphone adapters will work to charge other devices in common areas. Once you’ve assessed the practical usability of the cords, wires, and adapters you’ve collected, and removed the ones that have some function, contact the people around you to see if they could use them. Some people would love an extra charger to put in their gym or computer bag, or just to have around the house. This could go a long way toward getting rid of a majority of your older cables. 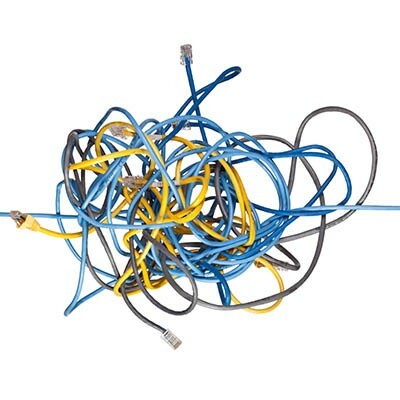 As for those cables, wires, and adapters that no one wants, and have no practical use for you, you should recycle them. At Washington Works, we recycle all types of hardware and connectors. If you can’t make it to us, and would like to know where the closest recycling center to you is, you can call 1-800-Recycling or visit the National Center for Electronics Recycling website. If you are looking at recycling your technology, give us a call at 301-571-5040 and one of our technicians can help you get your old technology go where it needs to go.